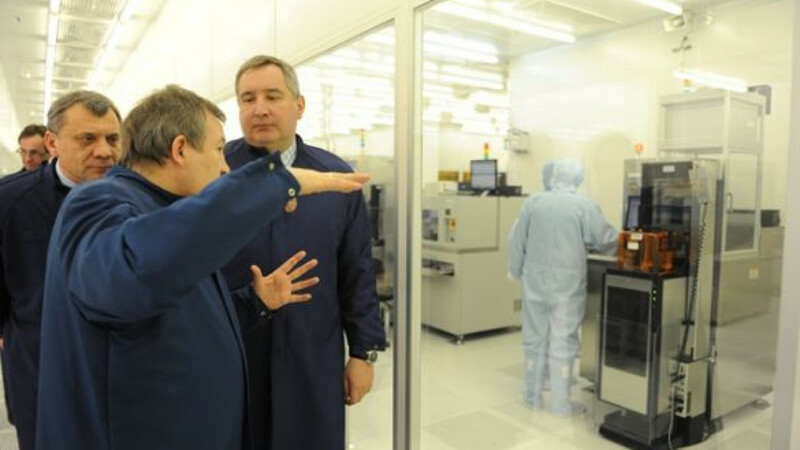 Deputy Prime Minister Dmitry Rogozin, third from left, touring a microchip factory owned by a Sitronics subsidiary in February. Business conglomerate Sistema might be forming a joint venture between its communications technology subsidiary, RTI, and an information-technology developer and supplier, NVision Group. Citing sources close to both sides of the deal, Vedomosti reported Wednesday that a binding agreement could be inked soon, with one source saying it could happen this week. The shareholders of NVision, a Moscow-based company with offices throughout Russia and in Uzbekistan and Kazakhstan, would own about 50 percent of the merged company, Vedomosti said, citing a source close to NVision. Two subsidiaries of Sitronics, a part of Sistema that is more than 60 percent owned by RTI, also would be used as vehicles in the deal. Sitronics develops and manufactures telecommunications products, IT and microelectronics. Sitronics will get newly issued shares of NVision, and then RTI would buy up a block of shares, Vedomosti said. Sistema isn't commenting on media reports about the matter, Sistema spokesman Vsevolod Sementsev said. As a publicly traded company, Sistema can comment only on deals that have been completed, Sementsev said by telephone. The conglomerate is traded on the London Stock Exchange. An NVision spokeswoman said by phone that her firm couldn't comment on the deal "while it is incomplete." The agreement reported in Vedomosti differs from the preliminary one announced by Sistema in January. Under that setup, Sistema would buy NVision in a two-part deal that would give RTI shareholders half of NVision's shares and allow NVision shareholders to trade in the other half for RTI shares. In addition, NVision was to receive up to $200 million in cash, a "substantial share" of RTI's capital and "significant representation" on RTI's board of directors. Sistema is a vastly diversified conglomerate. Its wide array of investments comprise what it calls its "fundamental assets," which include major oil producer Bashneft, cell phone services provider Mobile TeleSystems and energy concern Bashkirenergo, and its "developing assets," such as children's good retail chain Detsky Mir and medical company Medsi. On Sistema's website, RTI is listed as one of the developing assets.